Horses can have colic for innumerable reasons and even with veterinarian care, the cause can go undiscovered. It’s important to remember that colic is actually a symptom, not a disease in itself. So because it is a symptom of another problem, there is no one sure-fire treatment that will alleviate all colics. Some colics may be just a 'tummy ache' from a change in the weather or mental upset. Or, colic symptoms may indicate a far more serious, even life-threatening problem. The distress that a horse is in while it colics indicates that there is something going wrong with the digestive system. Here are some common reasons your horse may be exhibiting colic symptoms. ingesting foreign objects can all trigger colic symptoms. Some owners claim nervous horses can experience a change in management. Parasite damage or load can cause a horse to exhibit colic symptoms. The parasites irritate the intestinal tract as they cause damage. Horses with a parasite load, or who have just been dewormed because they have a heavy parasite load may colic. Parasites can also cause damage to the intestines that can lead to ongoing problems. This is why it is so important to keep internal parasites in check with an effective, regular deworming program. Kidney stones may also cause colic symptoms. Anything that goes awry with the internal organs may make the horse appear colicky. Colic can be caused by too much food eaten too quickly, or drinking a large amount of cold water. Especially if the horse has EGUS, it may be colicky after eating or drinking a large amount. When the weather is cold, keep your horse's water above frigid temperatures with a heated bucket, a trough heater or by carrying out hot water to mix with the cold. This will prevent a cold shock to its belly. And, if your horse drinks more in the winter, it's less likely to suffer impaction colic. Twisted intestines and telescoped sections of intestines occur and the cause is unclear. 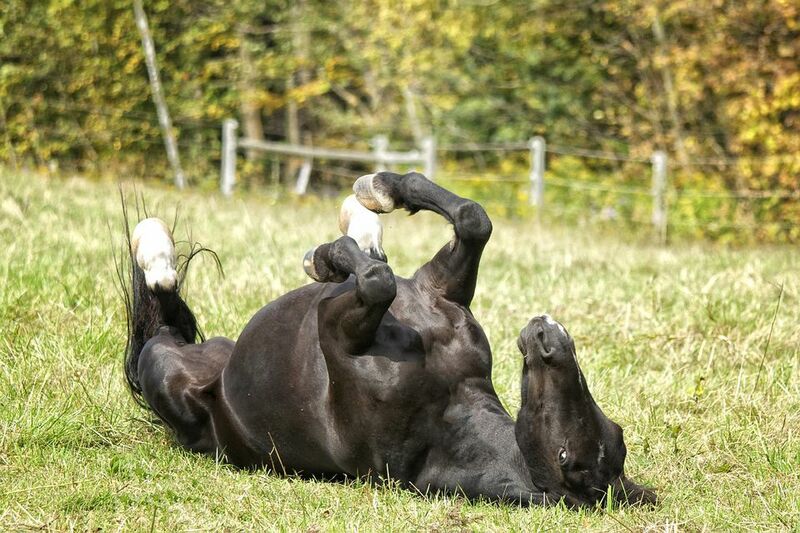 Some people believe it happens when a horse rolls, it can cause a loop of intestine to loop, telescope or twist. Some feel it's more likely to happen with big barreled horses or mares who have had several foals. Fatty deposits on the intestines can cause them to flip or twist. There are horses who have had multiple surgeries to correct twists. We still don't know the exact reason this happens. Any horse regardless of age or temperament can have a bout of colic and often the root cause goes undiscovered. How Much Can It Cost to Buy a Horse?